So you’ve decided to build a new garage? 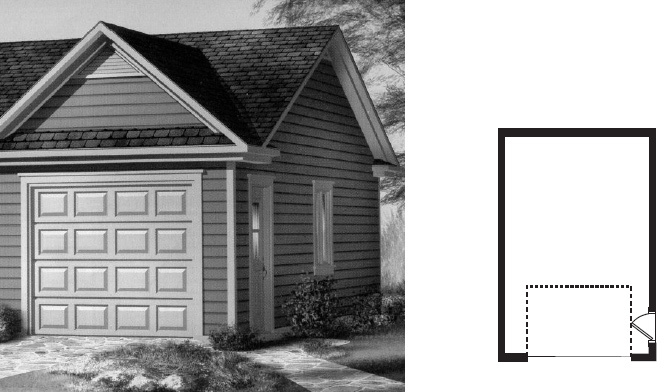 If you made a sketch of your garage yourself, be careful where you placed your access door to the garage, often 6'6" x 3'. If you are intending to install it as in the following diagram and you want a 7-foot garage door, there must be enough space over the door (at least 15 inches) to use a larger than standard track radius. It has to be that way so that your 78-inch-high access door can pass under the horizontal tracks. To help you make an "enlightened" choice on the purchase of your new garage door, contact us! What’s more, we can provide you with a free quotation. An alternate solution is to have an 8-foot garage door. Incidentally, the headroom required for a standard lift (after the interior finish is completed) is 12 inches plus 2 inches to install an electric garage door opener. You can count on even more headroom if the floor-to-ceiling height allows it. For instance, if the distance between the floor and the bottom of the roof trusses or the drywall panels is more than 18 inches, you can install high-lift hardware thus moving the tracks as close as possible to the ceiling. This is awfully practical if you work on cars in your garage. Contact us now so we can help you make the best possible choice. We have been garage door specialist for a long time. Our goal is to make buying your next garage door a pleasant experience. We will respect your needs, your tastes and especially the budget you have fixed. Lastly, we also provide electric garage door openers along with their accessories to answer your everyday needs.